Dr. Lo was an undergraduate at Harvard University where he received the honorary John Harvard Scholarship, went to medical school at SUNY Buffalo and interned at the University of Illinois at Chicago Medical Center. 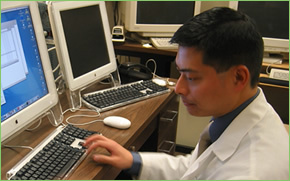 He trained in Neurology at the University of Chicago Hospitals, where he served as co-Chief Resident from 2003 – 2004. He started his Post-Doctoral Fellowship at the Neurological Institute, Columbia University Medical Center in 2004 as a Clinical Fellow in Movement Disorders under Stanley Fahn, MD. He is a member of American Academy of Neurology and the Movement Disorders Society. As an academic neurologist, Dr. Lo has given talks and written papers on the diagnosis and treatment of movement disorders with an emphasis on dystonia and Parkinson’s disease. Dr. Lo joined the Georgetown University Hospital in Washington, DC in July 2006.